1994 Jeep Cherokee headliner repair - removing and reinstalling the headliner board. Whew, what a mess of a bag in this 1994 Jeep Cherokee headliner, if it wasn't for the dome lights, it would have blown out the window a long time ago. Not a problem though, a couple of hours and it will look like new again. This Jeep Cherokee had 2 rear speakers in a abs shell at the rear of the vehicle. 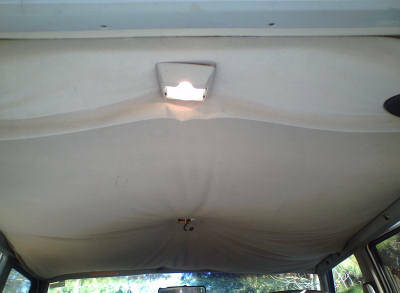 The dome light and side trim held it in place. The speakers had to be unplugged to remove it. For this one, you will need a torx T20 and T50(for seat belt mounting brackets). 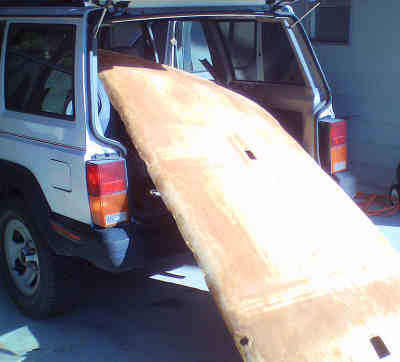 > Another shot of how the headliner in this Jeep Cherokee had turned completely loose. We didn't have to pull at this one to get it off, it fell off when we removed the dome lights and visors! You can get a good view of what the speaker box looks like at the rear of some of the Jeep Cherokees, we recovered this with 15 inches of headliner material, plus the 82 inches it took to do the headliner in this Cherokee, the Cherokee headliner kit works for the whole thing. This is a shot just to show how the headliner comes out, the rear gate is the easy way (which most people would figure out quickly). The headliner board in this Jeep Cherokee is made of the softer fiberglass with a thin layer of plastic over it - care needs to be taken when cleaning a headliner board like this so as not to peel up the plastic film. 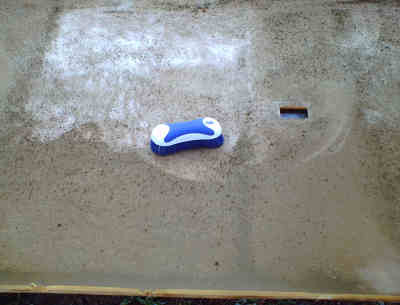 Use soft bristled brush to remove the old foam. When recovering the headliner board, either do it 1/2 at a time, or you can do about 1/3 at a time. It may be wise the first time; doing it about 1/2 of the board at a time. 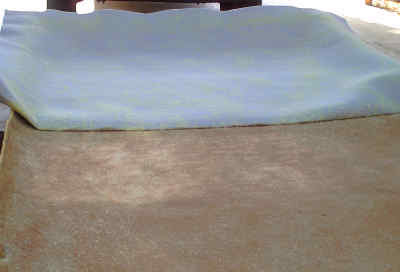 To do this; lay the material on the headliner board and fold about 1/3 of it back to apply the adhesive. Adhesive goes on material and board. The speaker mount at the rear of the headliner in the Jeep Cherokee is recovered, to do this, remove the old headliner material, clean it up, remove the speaker covers (not speakers) and put the new material on it. When headliner board and speaker box is finished for Jeep Cherokee, put it back just like it came out and I believe you will be pleased with how it all turned out. This 1994 Jeep Cherokee got a little more than a headliner in our trim shop, the seats and the carpet were replaced. It looked like a new vehicle when it left, at least on the inside. I'm not sure how many miles you can get out of a 94 Cherokee Sport - I would think it is according to how well it has been cared for by the previous owner. 250,000 miles is common from a vehicle now a days. Thank you for all your knowledge. Does anybody know how many miles 94 jeep grand Cherokee laredo can take on before trans and engine need replacing. I know it depends on many things but curios how many the highest has gotten on a well maintained 94 laredo. Thank you very much. I just bought one last night site unseen, never did this type of thing before. I heard these vehicles were excellent no matter what. Yes this kit will work for your Grand Cherokee. Did you mean a sun roof ?? Yes, it is the same procedure for the 97 Cherokee. Just wondering if this works for a 97 Cherokee Classic? 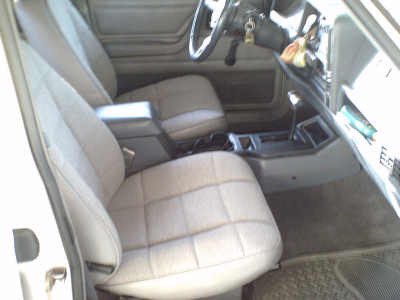 A regular cherokee kit will work for this vehicle. 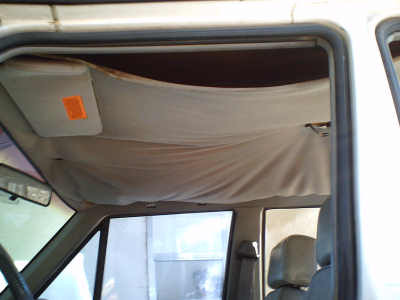 We can do the headliner in a Cherokee with one can of adhesive, but if in doubt, may be wise to get an extra one. We have a 1997 Jeep Grand Cherokee. I would say probably medium gray. Does the general Jeep Cherokee kit work for this vehicle? Will I need extra glue with the kit? Thank You for all the effort you put into this page.